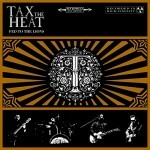 Share the post "Album review: TAX THE HEAT – Fed To The Lions"
I first came across Tax The Heat supporting prog/pomp rock veterans Kansas back in 2014 and was suitably impressed by their live show. Since then they have toured extensively and signed with Nuclear Blast. The latter does cause online consternation among some metal fans on the band’s YouTube videos, who are expecting a much more extreme metal act to be on the label. Instead we have this four piece – Jack Taylor (drums), Antonio Angotti (bass), JP Jacyshyn (guitars), Alex Veale (vocals/guitars) – belting out an album of intense and hard rocking blues based tunes. Nuclear Blast aren’t daft as in this band they have one who can easily step in and have a much wider appeal outside of the metal arena. Opener ‘Highway Home’ far jumps out to the speakers, wallow in the guitars and booming bass riff on this one. ‘Animals’ is the most instant song on here, sure it has a White Stripes/Jack White and QOTSA feel, but what a tune! The vocals of Alex Veale really make the listener sit up and take note, one minute putting venom into the verses and then soaring melodically at the choruses. Jack Taylor’s drum sponsors must love him as he fair belts out the drums and percussion, none more so than on ‘Under Watchful Eye’. The guitars and bass are not to be outdone though and on this song, as indeed on all of the album, the mix is spot on. The band do manage to take a musical breather on ‘Some Sympathy’, the nearest they come to a ballad. Neat slide playing seguing into a glorious chorus – for a debut album this is more like the sound of a band who are well into their recording career, such is their musical confidence and strong songwriting. This entry was posted in ALBUM REVIEWS, ALBUM REVIEWS (Mobile), All Posts and tagged album, alt rock, blues rock, Fed to the Lions, Nuclear Blast, review, rock, Tax The Heat. Bookmark the permalink.